A GIANT BABY! 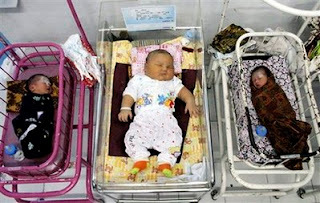 Weighing in at 8.7 kilos or 19.2 lbs, this little, err...big bundle of joy is the heaviest baby born in Indonesia as of yet. He was of course born via the C-section. I can't imagine him being born the natural way, 'ya know. I wonder how much milk he eats everytime he gets hungry...and at this stage I'm sure he gets hungry a lot of times. I read about this too. grabe, I wonder what the Mom ate during her pregnancy. may diabete kaya siya? weekend na ulit. anything planned? heard/seen that on the news and grabe! my son was 10.6 lbs and was really heavy for me,, what more for a 19.2 lbs!! haha grabe talaga! hi J! yup, this kid's mom is diabetic, no doubt about it. my youngest too was born at a whopping 10.15 lbs. she weighed like she was 2 months when she was born. anyway, how are you na my friend? di pa ko maka update ulit, pa bisibisita lang muna. okay, sa sunod na lang ulit and thanks for the visit pala. ciao!